Mr Baker auditions a DAC that really smokes (metaphorically speaking), and will have any music lover, hi-fi-inclined or otherwise, falling in love with their favourite tracks all over again. I’M REALLY ENJOYING being a music fan in the digital age in which we find ourselves. Even for a vinyl enthusiast, the internet is an essential tool for exploring potential LP purchases and discovering new artists. This can be done from the comfort of your home or even, as I’ve found myself doing on more than one occasion, in the middle of a record store when you need to look up one more review in order to help you decide on which album you’re taking home. With digital music it is even easier. Once you’ve ripped and tagged your CD collection to a computer hard drive, you need rarely buy another CD again. You can download music in any format from a huge range of websites such as Bandcamp.com, HD Tracks, iTunes, from independent labels, even directly from the artist’s themselves. You can spend hours – and a fortune – buying and downloading entire albums and within minutes be streaming them in high quality audio without even having to get off your bum. Unless you have to get up to do wees every five minutes. Then of course there’s the streaming. [What, streaming wees? – Frequent Pisser Ed] I’m not a user of Spotify or its ilk but I stream a number of radio stations from around the planet and the audio quality is generally surprisingly good. (Ironically, I’ve found stations streamed in New Zealand to be of much poorer quality, often to the point of being downright unlistenable, sounding as if they’re being transmitted through treacle). My current favourites include WFMU from New Jersey, KCRW from LA, KJEM 24-7 Jazz as well as many more from all over the world. Of course you can listen to all this digital music straight off your computer, but to get CD or better quality sound, connecting to a decent DAC is essential and the Octave Mk II Mini from Metrum Acoustics in the Netherlands could be the ideal solution. Measuring 190 x 60 x 245mm (w x h x d) it is mini only when in comparison to its bigger brother, the more imposing Hex, so it’ll slot into any system nicely without being invisible. Basically a black metal case with an aluminium front panel featuring three input selection buttons, plus one for power standby and four corresponding LEDs, it has a certain unassuming modern charm in its minimalism and it looks and feels very well constructed. With just the three inputs – USB, Optical and Coaxial – and a pair of RCA outputs, the Octave really is nice and simple. The coaxial input could prove a bit annoying for some users in that it’s a BNC style connection so you will need to get a little adaptor for your digital cable, unless you have, or are willing to obtain, a BNC cable. There’s also an IEC power plug located next to the main power on/off switch, which is always good for those who like to experiment with aftermarket power cables and for those with a particular disdain for wall warts. The solid state Octave, like its more expensive brother the Hex which I reviewed late last year, caters for almost all file types (MP3, FLAC, et cetera) and all sample rates up to 24/192 kHz (though the optical input only goes to 96 kHz) and, crucial to its design philosophy is a non-oversampling (NOS) design – see my Hex review here for more on that. It does not process DSD files however and, while I’m on the subject, neither does the Hex – a slight oversight on my part. I am nevertheless pleased to announce that the mighty looking, newly released (and new flagship) Metrum Acoustics ‘Pavane’ DAC could very well be the answer to all your DSD needs. Unlike the original Octave, the Mk II is a one box unit and borrows some technology from the Hex, including the receiver section for 192 kHz samples and the (optional) USB2 module. Though where the Hex has its own transformer dedicated to powering the USB, the Octave’s USB is powered by your computer as well as taking the digital signal. It seems Metrum designer and owner Cees Rujtenberg has devised his own clever way to keep the signal and electrical sides completely separate in order to give the cleanest data signal possible. It may be worth experimenting with one of those dual head USB cables where one of your computer USB ports is used for drawing power and the other for taking the signal – but then that could also be entirely unnecessary. 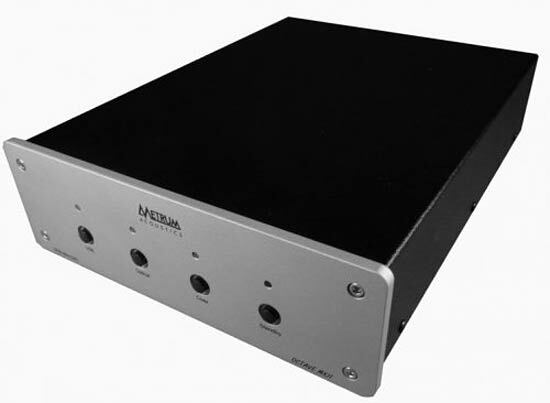 Both the Hex and Octave MkII used an M2Tech USB driver – as per each review unit – but it seems, according to the Metrum Acoustics Facebook page, that Mr Rujtenberg has since ditched M2Tech for another driver made by a company called Anamero as the M2Tech became outdated and a newer version was unavailable. In any case, it is an excellent integration which works very well, and sounds good too. If you’re of the inquisitive persuasion, as many audiophiles are, I’d suggest that you needn’t bother taking the cover off for the purpose of discovering the origin of the eight DAC chips. Because if you do, you’ll find all the labels have been cunningly scratched off – Mr Rujtenberg intends to keep that little secret to himself for as long as possible. What you will see inside if you must persist in your prying endeavours is some very tidy and assuring workmanship along with a nice little power transformer and not too much empty space. Lastly, I’ll mention that if you are running a Windows PC, a CD is provided to install the driver needed to run USB 2.0 with your computer, which is a quick and easy process. For digital sources I used a NuForce CD8 CD player transport, a Squeezebox Classic for wireless streaming and my laptop PC running Windows 8.1 along with JRiver Media Player – using an excellent app called Gizmo on my Android smartphone for remote control. JRiver Media Centre is so much better than Windows Media Player it is almost upsetting. For comparison I had the Metrum Acoustics Hex and my MHDT Lab Stockholm DAC and MHDT Lab USBridge. The excellent little USBridge USB to SPDIF converter is a recent acquisition which has really boosted the performance of the Stockholm when using USB. Right away the Octave MkII sounded fabulous with neutrality, pleasingly rich and accurate tones, spaciousness and, like the Hex, a very quiet noise floor, allowing delicate details and micro-sounds to be revealed while giving instruments and vocals better presence and dimension. But above all the Octave gave that feeling of warm well-being, pleasure, delight and exhilaration one gets when listening to a superb musical performance. Bass was equal to that of my Mhdt Labs Stockholm in terms of going satisfyingly low but the Octave gave undeniably better definition – some might describe such bass as sounding “tighter”. A good example of this was ‘Merrilands Domain’ from the Goodshirt album Good which came out so long ago now it hurts. Turning the volume up loud I was treated to beautifully strummed guitars on a bed of throbbing bass which was clear, detailed and nicely defined; where it gets a little wobbly around the edges through the Stockholm, here it remained sharp and in focus. ‘Merrilands Domain’ is a sweet, jaunty little number, perhaps overshadowed at the time of the album’s release by the more popular singles ‘Sophie’ and ‘Green’, but it makes for a darn good test track and the fact I kept replaying it while simultaneously and surreptitiously inching the volume upwards has to be a good sign – though I must stress that this is because I enjoy my music loud, not because it was essential to get the Octave sounding its best. Of course this is true of most DACs I play this track through – my own for one – to varying degrees but the more expensive Hex had a different level again of definition, three dimensionality and all that stuff (though not different by that much). Yet the Octave gives a refreshingly quick, no-nonsense approach to the music with a sound that is smooth and natural without over analysing things. And it is always great to hear a familiar piece of music eloquently reproduced with a slightly different flavour or emphasis. To demonstrate this I used ‘Pendulum’ from Dimmer’s superb I Believe You Are A Star album and the electronic “bubbling” that gradually becomes more prominent towards the end. With some DACs – or indeed, CD players – this bubbling effect can be heard up on the ceiling to my right, or with others it is more in the centre of the ceiling and still other players put it right in front of me. Playing this track through the Octave I was treated to great depth and scale as Shayne Carter’s voice swung between the speakers, pendulum style. The darkly ominous bassline created a certain intensity beneath the spitting, popping sound effects and guitars and indeed, where the Squeezebox/Stockholm put the “bubbling” flat into the right hand corner of the room, the Octave had it firmly on the ceiling, centre right. As a point of interest, my Stockholm USBridge/laptop had the effect centre right, halfway up the wall. I admit this is all nothing particularly earth shattering but it is quite interesting nonetheless – to me at least – and demonstrates the subtle differences that exist between different DACs, even models that could be described as sounding almost the same as one another. An Emerald City’s ‘Reindeer Running’ from their outstanding Circa Scaria album sounded incredible as it always does, although the Hex takes the prize for overall impact and exhilaration. The Octaves’ presentation was a little softer around the edges but still extremely insightful and enjoyable thanks in no small part to all the lovely tones and nuances of each instrument being easily distinguishable. And as usual the cave in which most of the recording was performed was a clear and integral part of the sound. I was moved by the superb timing and speed offered by the Octave and its ability to almost convince me with that clean and unfatiguing nature that it isn’t really a digital source at all. Spanish one man band Holograma (known to his madre as Fancisco Borjra) creates a poppy brand of electronica distinguished by its Kraut-rock leanings. One of the stand out tracks from his album Waves is ‘Moonlight’, with its sprightly organ motif, uplifting tempo and driving electro bass line. Spacey sound effects and dreamy vocals are interwoven to create an accessible psychedelic experience – or to put it another way, basically it’s a darn fine tune. When played through the Octave, the sound was huge and involving with swirling sound effects and an engaging rhythm, allowing the listener to be transported, taken on a mystical journey. Pure escapism at its finest. If you are one of those listeners who stresses constantly about whether or not your music is sounding ‘audiophile enough’, the Octave doesn’t allow you to dwell on this or other such analytical distractions. Instead the DACs presentation of rhythm, melody and structure along with natural tones and pleasing timing could redefine the way you enjoy music; by making it fun again. Yep, this is one DAC I would describe as not sounding just like all the others in its league. While I’ll be buggered if I can tell the difference between FLAC or WAV files (and I don’t fancy my chances blind testing high-res sample rates against standard CD quality files, if I’m completely honest) I do concede that highly compressed MP3 files aren’t my favourite format per se. But for me at least, it comes down to the music itself and so long as it is well recorded, made with good intentions or just downright creative and enjoyable, I really don’t care about anything else. It just isn’t worth becoming involved (or enraged) in the perpetual format wars that rage on discussion forums or in sweaty man-filled hi-fi shops. While it is true better quality recordings, MP3 or otherwise, sounded best through the Octave, any lesser quality albums didn’t sound truly terrible either; this DAC just won’t do that to you. During my time with the Octave I enjoyed a range of formats and sample rates, most of the time never giving a thought to anything but the tunes. Metrum Acoustics’ Octave Mk II is a definite notch above its similarly priced competition and a very real threat to those in the higher price thresholds. Not quite as good as the Hex but a damn good substitute, anyhow. This is a nice, tidy and simple looking unit but its looks are deceiving for the sound quality is complex and engaging and an absolute joy to behold. The big, rich and natural, non-clinical sound combined with excellent timing and rhythmic proficiency is likely to draw the usual comparisons with high quality analogue equipment and possibly even valve gear. If you’re using a computer as your main source then you want your DAC’s USB to sound at least as good as its other digital inputs. This unfortunately isn’t always quite the case but I found the Octave to be a delight to use and listen to in USB mode, and I spent most of my time doing so. For now I’m really rather pleased with my Stockholm/USBridge combination but if I happened to be in the market again, the Octave would be high on my ever-expanding list of potential DACs to own. Thank you for Hex and Octave II reviews and pleased they have provided some fun plus enjoyment. Neither do DSD as you have pointed out. Personal opinion here but I have been an adopter of so called ‘new formats’ (not to mention computer audio) e.g. SACD, DVD Audio and CD DTS 24/96 etc. All have failed – the hardware comes first but it takes decades to get a decent music catalogue. Wrong way round for consumers – which includes me. They are always more expensive too ! For what it’s worth, some of the best music reproduction (probably) I have heard, came/comes from CD DTS 24/96. The one format that probably died first. I find DTS throughout its various guises, superior to DD equivalents as well. Regarding the BNC connections on both Octave and Hex, a BNC/RCA connector is included with each product, along with a USB cable. Most users will have RCA as you point out but BNC has been a preferred connection for many manufacturers, given RCA connection was never designed for digital. Some consider that the reason many people prefer vinyl is because generally, the recordings are better (not all of course). Recording quality affects everything. I have noticed that often better (CD) recordings require more volume e.g. ‘Eric Bibb & Needed Time – Good Stuff’. This is an Opus 3, SACD/CD hybrid recording and highly regarded for its quality – no matter how you listen to it. Conversely ‘Prince – The Vault – Old Friends 4 Sale’ was a private recording made with some friends and not originally meant for release. Put this on at your previous listening level and the first notes will have you out of your chair real quick. The recording was pushed to the limit and you can tell. Just like the current trend for Remastering, some things sound better but not always across the board. It sounds good though. Lastly, although now almost ancient history, Apple either by design, neglect or accident, when introducing their Mavericks operating system some time back, immediately caused problems for a dozen or so manufacturers (and their many customers) re USB implementation. M2Tech were one such manufacturer and they came in for heavy flak from disgruntled computer users – who strangely seemed to ignore the real culprit. They then had a number of their own problems, which took time to sort out. Metrum bore flak too but were also just meat in the sandwich. Cees designed the USB2 module in response to this issue, given the delay involved above. M2Tech solved the situation middle of last year, with a new Driver (downloadable from Metrum and M2Tech). The ‘offender’ got off Scott free ! Pavane features an M2Tech XMOS module, which is of interest to Cees as a designer and will provide greater flexibility of use.